Pro 3 Amino contains three of the essential amino acids Lysine, Methionine & Threonine. Essential amino acids are the building blocks of Protein. Essential Amino acids must be obtained through the diet in adequate quantities to meet the body’s needs because these cannot be synthesized by the body in sufficient quantities. Lysine: Lysine is the first limiting amino acid. Lysine is found in a wide variety of tissues, hormones, and cells throughout the body. Myosin and other muscle proteins contain large amounts of lysine. Proteins that require lysine include the collagens and elastins that make up bone matrix, tendons, skin, and articular cartilage. Keratin protein in hoof and hair also requires lysine. Methionine: Methionine serves many key functions in the body, including support for connective tissue, liver function and detoxification, and strong hoof tissue. Methionine is needed for the production of cystine. Cystine is necessary to form the healthy “cross links” of collagen that add strength and elasticity, needed for healthy hoof, skin, hair, ligaments, tendons and cartilage. Methionine belongs to a group of compounds called lipotropics which help the liver to process fat in the body and so supports liver function. Methionine and cystine are naturally occurring “sulphur containing” amino acids. Sulphur is a key element and vital to life. Methionine combines with Lysine to form Carnitine, a carrier needed for the muscle to burn fat. Threonine: Threonine supports overall growth and helps keep connective tissues and muscles throughout the body strong and elastic, including the heart, where it is found in significant amounts. Threonine supports a healthy central nervous, and immune system function by aiding in the production of antibodies and is necessary for GI tract health. Threonine is needed to create glycine and serine, two amino acids that are necessary for the production of collagen, elastin, and muscle tissue. It is also needed to build strong bones & tooth enamel and to support healing and recovery from injury. Build healthy topline and muscle. Important for young growing horses. Aid collagen formation and tissue repair. 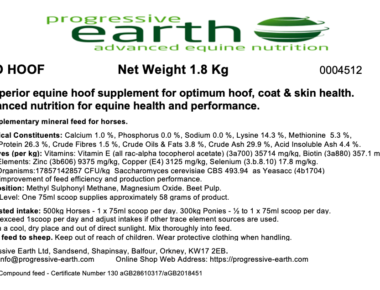 Support hoof growth and quality. Support immune system, healthy nervous system and overall health. Healthy skin, hair, ligaments, tendons and cartilage. Older horses that cannot maintain a healthy topline. For overweight horses and those on reduced hay rations. 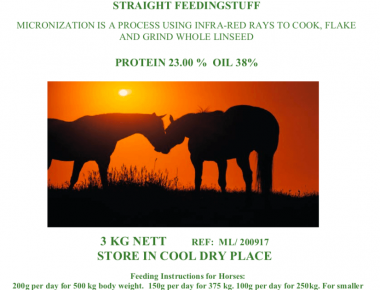 Support the increased demands of pregnant and lactating mares and growing foals. Support performance, strong muscles and healthy weight. Horses: 24 – 48g (half – 1 scoop). Maintenance = half scoop (24g) daily. Ponies: 12- 24g (Quarter – half scoop). Maintenance = 1/4 scoop (12g) daily. 1 x 75ml scoop provides approx 48g. Calcium 0.2 %, Lysine 41.8 %, Methionine 20.8 %, Threonine 6.25%, Crude Protein 70.2 %, Crude Fibres 7.7 %, Crude Oils & Fats 0.7 %, Crude Ash 6.8 %. Any questions? If there are any questions about Pro 3 Amino or any other of our range of products, please contact us by email. 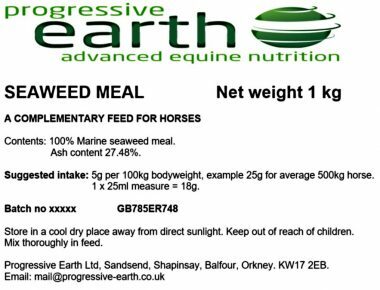 Pack size and availability: Progressive Earth Pro 3 Amino equine feed supplement is available in resealable grip seal pouches containing 1.44 Kg of product. A 75 ml scoop is included.